Raphaela Berding is a second year graduate student in European Union Studies. Her interests are in sociology, and she plans to complete a PhD in this field. Her research focuses on European culture and identity. She is from Germany and received her Bachelor’s degree in Multilingual Communication and Translational Studies. Berding has made her entry available in English and German as well. Most non-French speaking travelers who have visited France might have experienced that some French do not answer in English when tourists ask them for directions. Since the overall attitude in France towards English is that it is “the most desirable language to possess in one’s linguistic repertoire” (Costa and Lambert 2009, 19), one can assume that these French might not have sufficient knowledge of English, and that it is not part of the French curriculum. However, this is not the case. 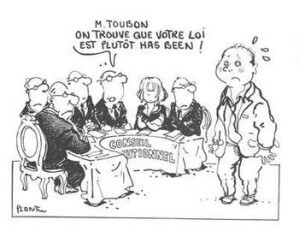 In the French education system, English is the dominant foreign language (21) and in 2008, the former Minister of Education declared that he wanted every student to become bilingual in English (19). Furthermore, English is studied by the majority of students, and their number is increasing (20). So at least the younger generation should have sufficient knowledge of English to be able to give directions to an American tourist. Hence, there must be another reason for the French attitude towards English, and this might be the pride of their own language. Could it be an exaggerated pride? French used to be a “prestige lingua franca for centuries” (Wright 2006, 35) which is why one might think it is legitimate for the French to be so proud of their language. Even though French is said to be an easy language to learn for English speakers (Knowlton 2014), it has its difficulties, and particularities even in the graphic level, like accents, ligatures and special characters. Throughout the francophone world it is not an unusual claim that French has “special qualities” (Wright 2006, 35). It seems that the French want the world to pay attention to these special qualities and their language again. In 2014, the French Ministry of Foreign Affairs and International Development published the “Promoting French Worldwide” strategy (French Ministry of Foreign Affairs and International Development 2014). Also, recently the French culture ministry has called for the creation of a new keyboard that would make it easier to use the special characters making the French language so unique (Breeden 2016). Indeed, some characters like the cedilla (ç) or ligatures (æ or œ) do not have dedicated keys and have to be inserted by complex keyboard shortcuts. In 1539, French became the official language in administration areas throughout the kingdom of France (Costa and Lambert 2009, 16-17). Later, under the rein of Louis XIV, France expanded its territory both in the Spanish and German-speaking world, and with the territorial expansion came the language expansion (Wright 2006, 37). French was declared to be used in negotiations and even replaced Latin as the written language of diplomacy (ibid.). At the same time, Paris was the major cultural and scientific center of Europe, and thereby produced more reasons for people to learn French (ibid. 37-38). All of this changed during the 19th century and France’s position on the continent was challenged, mainly by Germany, which was economically and militarily strong, Britain, which was a strong imperial power, and the United Stated, whose influence grew (ibid. 38-39). With the decreasing influence of France, also the French language lost its prestige. Hence, French was accompanied by English as a medium of discussion in the negotiations of the treaties after World War I, and even eliminated as a language in the negotiations after World War II (ibid. 39). Internally however, the Jules Ferry school laws from 1882 excluded any other language than French (Costa and Lambert 2009, 18), showing the rising concern of the French about the influence of their language. The legacy of the decreasing influence of French in the 19th century after it was flourishing in 17th and 18th century might be part of the reason why some French nowadays refuse to speak in English. They are insecure about their, and jealous the other language and want to show the world that their nation is not giving in to the dominance and temptation of speaking English. They probably hold on to their Golden Age, to the time when French was the dominant language in Europe, and everybody wanted to learn it. In the end, the evidence presented might indeed give the impression that some French refuse to speak English to prove people thinking the French influence is declining, wrong. However, another aspect that is worth mentioning, and might explain the attitude of French towards English, is that the French law has traditionally supported this special attitude and linguistic ideology in France. The Loi Toubon from 1994, a law relating to the usage of the French language, mandates that French is used as the “language of instruction, examinations and competitive examinations, as well as theses and dissertations in State and private educational institutions.” (Wright 2006, 51) This reminds of the Jules Ferry laws from 1882. From this derive two conclusions. 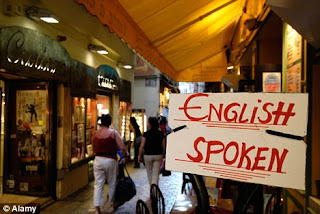 First, the French are not using English, namely because they are afraid of making mistakes while speaking it because they don’t know how to because the French law prohibits the use of English once the student graduate from high school. So instead of speaking broken English they rather pretend not to know English at all. Second, it shows that the attitudes presented are mainly institutional and come from the conservative population. Costa and Lambert (2009) point out that “language policy is a manipulative tool in the continuous battle between different ideologies” (16). As Wright (2006) explains, the French people “are aware […] that to reject English means to stay outside the global forums […] and this is a sacrifice they do not appear to be willing to make to pursue a national language policy.” (54) In other words, the French people are open to use English, but it is mainly the mainstream policy makers do not want to accept initiatives that involve approaches to plurilingualism (Costa and Lambert 2009, 24). Costa, James, and Patricia Lambert. "France and Language (s): Old Policies and New Challenges in Education. Towards a Renewed Framework?." (2009). 15-26. PDF File. French Ministry of Foreign Affairs and International Development. Promoting French Worldwide. Directorate-General of Global Affairs, Development and Partnerships, 2014. PDF file. Wright, Sue. "French as a lingua franca." Annual review of applied linguistics 26 (2006): 35-60. Die meisten nicht-Französisch sprechenden Reisenden, die schon einmal in Frankreich waren, haben es vielleicht schon erlebt, dass einige Franzosen sich weigern auf Englisch zu antworten wenn sie von Touristen nach dem Weg gefragt werden. Die generelle Einstellung in Frankreich ist, dass Englisch die beste Sprache ist, die man in seinem Sprachrepertoire haben kann (Costa und Lambert, 2009, 19, eigene Übersetzung). Deshalb könnte man annehmen, dass einige Franzosen einfach nicht genug Sprachkompetenz in Englisch haben, und dass de Sprache nicht Teil des Curriculums in Frankreich ist. Dies ist jedoch nicht der Fall. Englisch ist die vorherrschende Fremdsprache im französischen Bildungssystem (ebd. 21, eigene Übersetzung), und vor einigen Jahren erklärte der damalige Bildungsminister, dass jeder Schüler Sprachkompetenz in Englisch erwerben solle (ebd. 19, eigene Übersetzung). Ein Großteil der Schüler lernt außerdem Englisch, und die Anzahl steigt immer weiter (ebd. 20, eigene Übersetzung). Deshalb sollte doch zumindest die junge Generation genug Sprachkompetenz in Englisch haben, um englischsprachigen Touristen den Weg zu erklären. Es muss daher eine andere Erklärung für die Einstellung der Franzosen zur englischen Sprache geben, und die lässt sich im Stolz auf ihre eigene Sprache finden. Französisch war für Jahrhunderte eine angesehene Lingua Franca (Wright, 2006, 35, eigene Übersetzung), weshalb es vielleicht legitim ist, dass Franzosen so stolz auf ihre Sprache sind. Obwohl Französisch für englische Muttersprachler einfach zu lernen sein soll (Knowlton, 2014, eigene Übersetzung), ist das geschriebene Französisch mit seinen Akzenten, Ligaturen und besonderen Schriftzeichen, sehr kompliziert. Es ist tatsächlich nicht unüblich in der frankophonen Welt zu sagen, dass Französisch „spezielle Qualitäten“ hat (Wright, 2006, 35, eigene Übersetzung). Es scheint, dass die Franzosen nun wieder Aufmerksamkeit auf diese speziellen Qualitäten und ihre Sprache lenken wollen.2014 veröffentlichte das Französische Ministerium für auswärtige Angelegenheiten und Internationale Entwicklung die „Strategie zur weltweiten Promotion von Französisch“ (French Ministry of Foreign Affairs and International Development, 2014, eigene Übersetzung). Außerdem setzte sich das französische Kultusministerium kürzlich dafür ein, eine neue Computertastatur zu erfinden, damit es einfacher wird, die für die Französische Sprache so besonderen Schriftzeichen zu benutzen (Breeden, 2016, eigene Übersetzung). Tatsächlich haben einige Schriftzeichen, wie die Cedille (ç) oder Ligaturen (æ oder œ) keine eigenen Tasten, und können nur durch komplexe Tastenkombinationen eingefügt werden. Um diese Einstellung der Franzosen verstehen zu könne, ist es hilfreich einen Blick in die Geschichte Frankreichs zu werfen. Nachdem Frankreich im 17. Und 18. Jahrhundert politisch, ökonomisch, kulturell, technologisch und ideologisch dominierte, und viele daher aus Gründen der Profitabilität und Nützlichkeit Französisch lernen wollten oder mussten, verlor Frankreich an Macht und Einfluss (Wright, 2006, 50, eigene Übersetzung). Die Franzosen erließen zudem einige Gesetze um die Sprache intern zu schützen (Costa und Lambert, 2009, eigene Übersetzung). Französisch wurde 1539 zur offiziellen Sprache in der Verwaltung im Königreich Frankreich (Costa und Lambert, 2009, 16-17, eigene Übersetzung). Unter der Herrschaft von Louis XIV erweiterte Frankreich sein Territorium sowohl im spanisch- als auch deutschsprachigen Gebiet, und mit der territorialen kam die sprachliche Ausbreitung (Wright, 2006, 37, eigene Übersetzung). Französisch sollte in Verhandlungen gesprochen werden, und ersetzte sogar Latein als die geschrieben Sprache der Diplomatie (ebd., eigene Übersetzung). Zur gleichen Zeit war Frankreich kulturelles und wissenschaftliches Zentrum Europas, und bot somit noch mehr Gründe um Französisch zu lernen (ebd., eigene Übersetzung). Während des 19. Jahrhunderts änderte sich dies, und die vorherrschende Position Frankreichs wurde vor allem vom ökonomisch und militärisch starken Deutschland, von der Kolonialmacht England, und den immer einflussreicher werdenden Vereinigten Staaten herausgefordert (ebd. 38-39, eigene Übersetzung). Mit dem sinkenden Einfluss Frankreichs verlor gleichzeitig die französische Sprache an Prestige. In den Verhandlungen nach dem Ersten Weltkrieg zum Beispiel war Englisch die zweite Verhandlungssprache neben Französisch, welches in den Verhandlungen nach dem Zweiten Weltkrieg sogar komplett gestrichen wurde (ebd. 39, eigene Übersetzung). Innerhalb Frankreichs wurden mit den Jules Ferry Schulgesetzen von 1882 jede andere Sprache außer Französisch ausschlossen, was die wachsende Besorgnis der Franzosen über ihre Sprache zeigt (Costa und Lambert, 2009, 18, eigene Übersetzung). Das Erbe des sinkenden Einflusses von Französisch nach seiner Blütezeit im 17. Und 18. Jahrhundert könnte einer der Gründe sein, wieso einige Franzosen es heutzutage vermeiden, Englisch zu sprechen. Sie sind unsicher über ihre eigene Sprache, und neidisch auf die andere, und wollen der Welt zeigen, dass ihre Nation sich nicht der Versuchung und Dominanz des Englischen hingibt. Sie halten möglicherweise an ihrem Goldenen Zeitalter fest, als Französisch die dominante Sprache in Europa war, und jeder es lernen wollte. Die Ausführungen hinterlassen den Eindruck, dass einige Franzosen es vermeiden Englisch zu sprechen, um denjenigen, die denken, dass der Französische Einfluss sinkt, zu zeigen, dass sie falsch liegen. Allerdings ist auch zu bemerken, dass die französische Gesetzgebung die spezielle Einstellung der Franzosen zu ihrer Sprache und sprachlichen Ideologie traditionell unterstützt. Das Loi Toubon von 1994 etwa, was die Benutzung des Französischen reguliert, schreibt vor, dass Französisch als Unterrichts- und Klausursprache, als auch als Sprache für Arbeiten und Dissertationen in staatlichen und privaten Institutionen benutzt werden soll (Wright, 2006, 51, eigene Übersetzung). Dies wiederum erinnert an die Jules Ferry Schulgesetze von 1882. Daraus lassen sich zwei Dinge schließen. Erstens, Franzosen sprechen kein Englisch, weil sie aus Mangel an Sprachwissen Angst davor haben Fehler zu machen, da Gesetze es verbieten, Englisch nach Beendigung der Schule zu benutzen. Zweitens, die Einstellungen sind hauptsächlich institutionell, und stammen von der konservativen Bevölkerung Frankreichs. Cosa und Lambert (2009) unterstreichen, dass „Sprachpolitik ein manipulatives Instrument im ständigen Kampf der Ideologien ist“ (54, eigene Übersetzung). Wright (2006) erklärt, dass Franzosen sich darüber bewusst sind, dass die Abneigung gegenüber Englisch dazu führt, dass sie außerhalb des globalen Forums bleiben, und dass sie nicht bereit sind, Opfer zu bringen und keine Änderungen in ihrer nationalen Sprachpolitik machen wollen (54, eigene Übersetzung). Mit anderen Worten, die französische Gesellschaft ist zwar offen gegenüber der Verwendung von Englisch, aber die etablierten Entscheidungsträger wollen keine Initiativen, die Ansätze zur Mehrsprachigkeit enthalten, akzeptieren (Costa und Lambert, 2009, 24, eigene Übersetzung).